We need you to call your Senators and demand that they vote for the Reid-Sanders Social Security Protection Amendment. Majority Leader Harry Reid (NV) and Senator Bernie Sanders (VT) are leading the fight in the Senate to protect Social Security from drastic cuts. The vote will be this week. 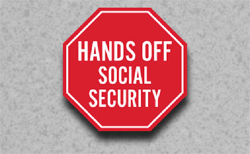 I strongly urge them to vote YES on the Reid-Sanders Social Security Protection Amendment. Please take the time for this very important effort today. This is for all of us who depend on Social Security. Call Today: 1-866-251-4044.